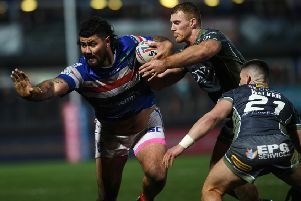 STILL FIGHTING: Tinirau Arona has been one of Wakefield's stand-out players this season. .
FINISHING above defending champions Wigan Warriors is the incentive for Wakefield Trinity now, fans’ player of the year Tinirau Arona says. St Helens’ win at Salford Red Devils two days ago lifted them three points clear of Wakefield and ended Trinity’s top-four hopes. Wakefield will go into today’s final game of the season in sixth place, one point and a place below visitors Wigan and Arona insisted they still have something to play for, despite the semi-finals being out of reach. “We want to finish with a win,” Arona said. “We are still going to go out and try and put in a big performance. Arona admitted the season has been a case of what might have been. He added: “We’ve just missed the mark in a couple of games, especially in the last couple of weeks, but we have also won a few games in the last minute and got a bit lucky. 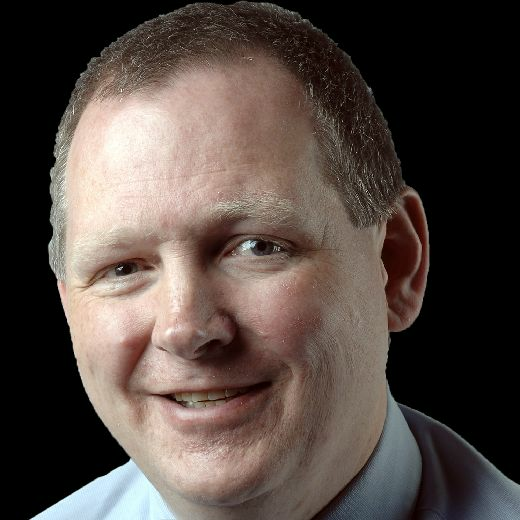 Trinity have lost their last two games – to St Helens and Hull – by a combined total of three points. “Looking back, we have come out of the blocks really fast and given ourselves a good chance to finish off the game,” Arona recalled. “We’ve spoken about the start of our second halves – we’ve just missed the jump a bit which has let us down. “Our completion rate in the second half compared to the first has let us down. Coming into the last minute or two of the last two games it could have gone either way. Arona has had an outstanding year and said he was “proud” to receive the supporters’ award as the team’s top performer. “I have only scored one try and fans usually vote for the big tries and the big breakaways,” he said. “It just goes to show that our fans appreciate the football and the hard work that goes into our game. Reece Lyne (ankle) and Keegan Hirst (illness) could return for Trinity today, Dean Hadley is available after suspension and Sam Williams could also be recalled. Tyler Randell is sidelined by a leg injury and James Hasson drops out. Sean O’Loughlin (calf) is set to return for Wigan. Liam Marshall and Joe Bretherton are in contention, but Joe Burgess (hamstring) is out. Wakefield Trinity: from Annakin, Arona, Arundel, Ashurst, Caton-Brown, England, Fifita, Finn, Grix, Hadley, Hirst, Huby, Jones-Bishop, Kirmond, Lyne, Miller, Tupou, Williams, Wood. Wigan Warriors: from Bateman, Bretherton, Clubb, Davies, Farrell, Gelling, Gildart, Isa, Leuluai, Marshall, McIlorum, Nuuausala, O’Loughlin, Powell, Sutton, Tautai, J Tomkins, S Tomkins, Williams.